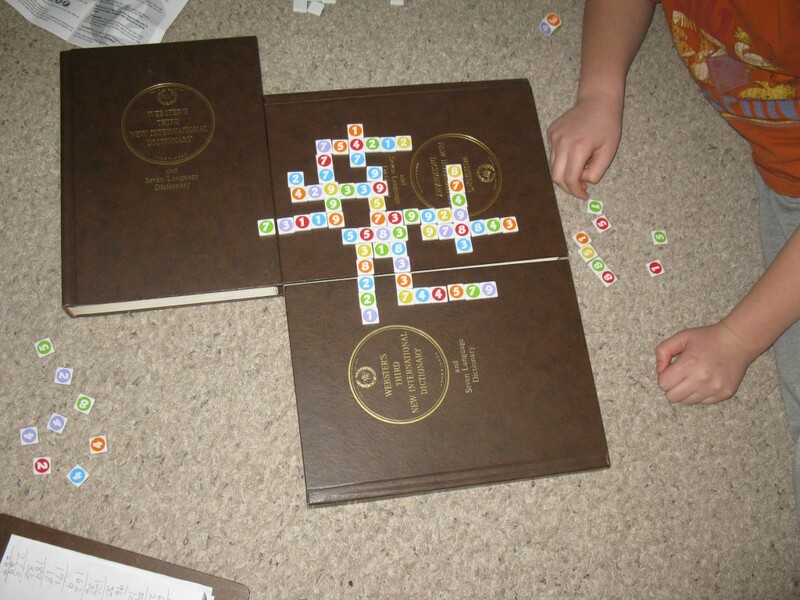 Players start with 8 tiles each turn and add as many of their tiles to the crossword as they can. The tiles have to be in a row and the digits must add up to the multiple of the game. One limit of the game is that each row can only contain six tiles — one tile for each of the six game colors. If a player is able to place all six colors in a row in one turn, that player can lay another row of tiles from the tiles he/she already has. Each turn players’ scores are based on the sum of the digits on the tiles in the row they played — including the tile they are building off of. When we play, we each keep track of our own score to give more math practice. I find that our games go more quickly as the kids master their multiples and recall them with increasing speed.